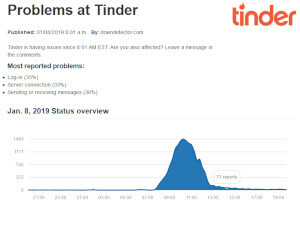 Tinder users were frustrated earlier this month when they tried to message and browse matches on the app, but instead got recurring error messages. The app was down for several hours starting at around 5:00am PST on Tuesday January 8, according to reports. Users across Europe, the U.K. and the U.S. experienced problems sending and receiving messages, as well as server connection errors according to news website CNET. Some users also reported that they were unable to login at all. This outage came at an inconvenient time – during one of the most active times for dating app users everywhere. The days between New Year’s and Valentine’s Day are part of the online dating world’s “high season” – where more people are logged in and more activity is happening across all dating apps as people renew their search for relationships or hookups. In fact, the Sunday after New Year’s is typically the best day of the year to be on a dating app due to the high volume of users logging in and messaging. The outage came less than 48 hours after this peak dating time. Website Down Detector was the first to report on the outage. They noted that 41 percent of the issues reported regarding Tinder were from users unable to send or receive messages, while 32% were from users who were unable to log in. According to Tinder’s Help page, if a user experiences problems logging into the app then they should force quit on their phone and try again to make it work. But many users tried this and got no results, so it appeared to be a problem with Tinder’s servers. After a few hours, Tinder seemed to resolve the issue and users were back online. However, many reported that their saved matches were deleted. Tinder posted on its website that if users experienced this loss of matches, they should try logging out of the app and logging back in again. The company hasn’t issued a response to the outage yet, and some users are still reporting problems with the app on Down Detector, though the majority of users seem to be able to use the app per usual. For more on this dating app you can read our Tinder review.